Glaucoma is a term applied to a group of eye diseases that cause a characteristic and recognizable deterioration of the optic nerve. 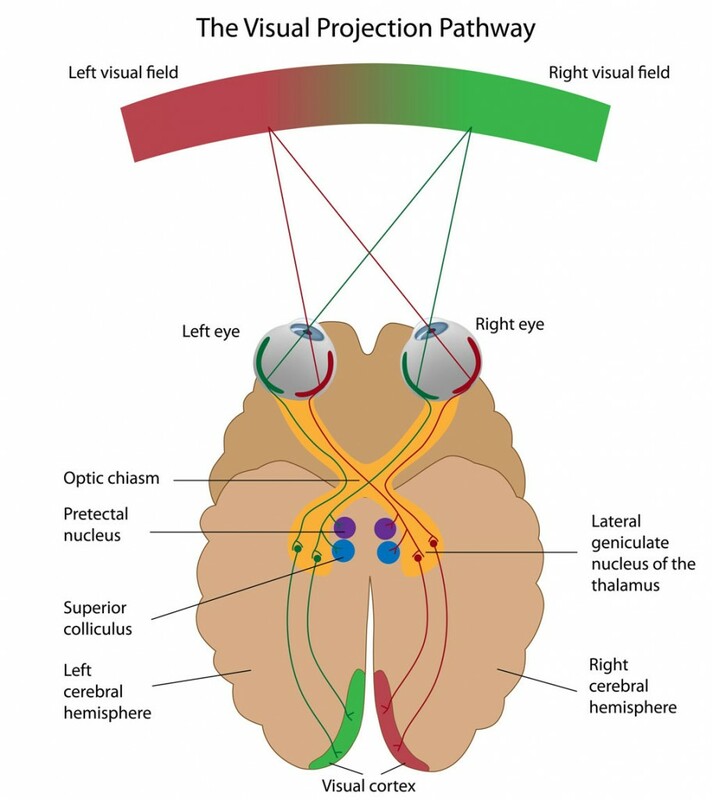 The optic nerve carries visual information from the eye to the brain, much like the cable from a computer screen to the computer. In the brain, it is assembled into a visual image that we recognize as sight. The simplest definition of glaucoma is that condition of the eye where the intraocular pressure is elevated beyond the limit that will permit normal function of the optic nerve. However, there are two parts to the definition. First, it implies the presence of abnormal intraocular pressure, generally above 21 mm Hg, which is somehow due to an abnormality in aqueous drainage from the eye, or impediment to aqueous flow from the posterior to the anterior chamber of the eye; second is the suggestion that the intraocular pressure somehow embarrasses the nerve fibers ganglion cells, the final neural pathway from the eye to the brain. The fact that this definition is simplistic is easily demonstrated be the patient with the so-called "normal" intraocular pressure, generally below 21 mm Hg, who has typical glaucomatous cupping of the optic nerve head and characteristic visual field defects. Then there is the patient with the marked elevation in ocular pressure, usually from an inflammatory condition, who sustains no optic nerve alternations even after a protracted period of time. Thus, glaucoma defies a simple explanation. When the optic nerve is damaged or injured, the transmission of visual information and, hence, the visual image is impaired. 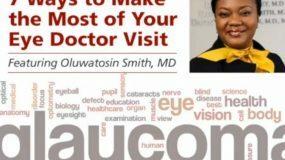 Fortunately, ophthalmologists can usually detect glaucomatous optic nerve damage before there is noticeable visual loss by examining the back of the eye. Sometimes, damage to the nerve can be observed before there is a change in vision by specialized tests of vision. 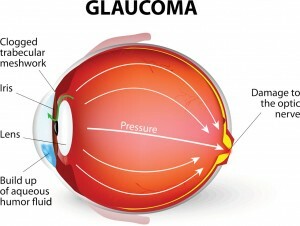 In many cases, glaucoma optic nerve damage occurs from high eye pressure. Nerve damage can usually be stopped or slowed by lowering the eye pressure. 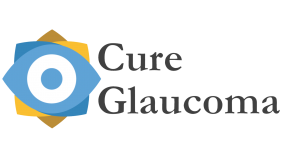 Most glaucoma treatment, with medicines, laser, or conventional surgery, is designed only to lower the eye pressure. Some eyes with glaucoma optic nerve damage continue to deteriorate despite having the lowest possible eye pressures. It is not known why this happens. Intensive research around the world is now directed at understanding the cause of the damage in these patients and to develop new treatments to preserve the optic nerve. Many different eye disorders cause high eye pressure. After measuring the eye pressure, your ophthalmologist attempts to determine the cause of the elevation. Nearly always, some form of "clogging" or blockage of the drainage of internal fluid within the eye (aqueous humor) causes increased eye pressure. Since the eye continually produces this fluid, obstruction of the drainage causes the eye pressure to increase. Almost any eye disorder associated with aging, inflammation, bleeding, injury, tumor or even birth defects can raise the eye pressure. However, in most cases of glaucoma, the eye has no specific abnormality and is said to have primary open-angle glaucoma. In other cases, the eye may be unusually small or exhibit other minor shape abnormalities that cause closed-angle glaucoma. In closed-angle glaucoma, the drainage system is totally blocked instead of just being clogged. At least fifty different mechanisms have been described that can raise the eye pressure, but all produce similar damage of the optic nerve. All methods of glaucoma treatment are designed to lower the eye pressure to a level that will prevent further optic nerve damage. "How's My Optic Nerve, Doctor?" Ongoing assessment of glaucoma depends upon regular examination of the optic nerve and visual field in addition to the eye pressure. The well informed glaucoma patient asks not "What is my eye pressure, doctor?," but rather, "How is my optic nerve?" Acute angle-closure glaucoma is a dramatic disorder of sudden onset and represents a true ophthalmic emergency. If not properly diagnosed and treated, progressive, permanent ocular damage occurs in a matter of hours to days. The history is characterized by the quite sudden onset of pain, redness of the eye, and blurred vision. The pain is usually severe and generally centered over the brow. Nausea, vomiting, and profuse sweating are commonly associated symptoms which may lead to improper diagnosis and treatment in an emergency room setting. Oblique flashlight illumination showing shallow anterior chamber, corneal edema and mid-dilated pupil. Gonioscopic appearance shows closed angle without any visible angle structures. Note how the corneal beam tapers towards the Schwalbe's line. There are numerous sequellae of an acute angle-closure attack. Vision is often affected and visual recovery is variable. 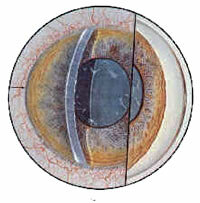 Following an attack the cornea frequently develops folds in Descemet’s membrane; recovery is usually complete, although some degree of endothelial cell loss may occur. Occasionally, chronic corneal edema develops despite normalized intraocular pressure. This most often occurs in patients with pre-existing Fuch’s dystrophy, or long-standing angle-closure prior to treatment. During the acute attack, sector ischemia of the iris may occur due to closure of its stromal vessels, and if marked, causes an aseptic anterior uveitis occasionally severe enough to produce a hypopyon. Ischemic necrosis of the iris causes sectorial atrophy, usually in the horizontal meridian. 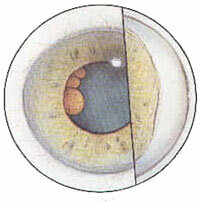 Though iris hole formation is rare, detachment of the superficial iris stroma may occur and can mimic iridoschisis. The pupil may remain permanently dilated and unresponsive to miotics or mydriatics because of sphincter damage. In many cases there may also be characteristic “spiraling” of the superficial iris stroma. 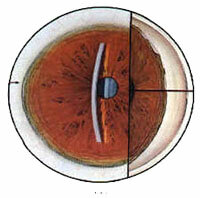 In such instances, the iris fibers appear to originate at a point near the pupil margin and fan out, in an oblique fashion. Rarely, pupil dilation can be so wide that it makes lens-iris block impossible, thus breaking the attack spontaneously and making an iridectomy unnecessary. Due to the sudden sustained rise in intraocular pressure, lens opacities called glaukomflecken may appear. These opacities represent areas of lens epithelium necrosis. Clinically, they initially appear as small whitish cloudy areas beneath the anterior capsule in the pupillary zone. They are permanent, and become increasingly denser and, with time, move deeper into the anterior cortex. Frontal view showing shallow anterior chamber, diffuse iris stromal atrophy, spiraling of the iris stroma inferiorly, and glaukomflecken of the lens. Gonioscopy shows permanent synechial closure. Primary cysts of the iris and ciliary body are uncommon, and only rarely cause glaucoma. Recently, however, Vela and colleagues reported three families in whom angle- closure glaucoma occurred in 4 of 11 patients with such cysts. It was suggested that in some instances of such cysts there may be autosomal dominant inheritance. There are no known systemically related disorders. Slit-lamp evaluation may reveal a smooth irregularity to one or several areas of the iris with little alteration of normal surface markings. 1.) Peripheral anterior synechiae may form in the region where the cyst presses the iris forward to touch the angle structures. 2.) In affected individuals, gonioscopy shows partially closed angles in the region of peripheral mounds. 3.) Following pupillary dilation one may directly see the pigmented peripheral iris cyst(s) and gonioscopy may reveal smaller nonpigmented ciliary body cysts. In instances where the intraocular pressure suddenly rises, pilocarpine can normalize the pressure. Peripheral and sector iridectomies have been relatively unsuccessful in managing these patients. Pigmented iris cysts can be treated by puncturing their walls with argon laser photocoagulative surgery. However, the cysts may redevelop and again close the angle. The nonpigmented ciliary body cysts do not respond to argon laser treatment. In time, the affected patients may have to undergo standard filtering surgery to control their secondary synechial angle closure glaucoma. 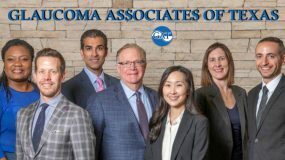 Patients with angle-closure glaucoma secondary to iris and ciliary body cysts should be carefully followed and their family members examined and appropriately counseled. 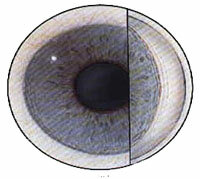 Multiple pigment cysts of the iris can be seen through the dilated pupil. The angle is irregularly narrowed and a broad peripheral anterior synechiae has formed. The primary angle-closure glaucomas are conditions which by definition result in functional or organic obstruction of aqueous outflow at the trabecular meshwork by iris tissue. 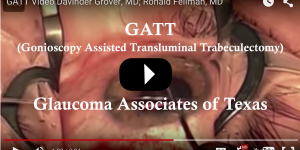 Gonioscopy is the key to their recognition and classification. A thorough knowledge of the normal angle is imperative before the subtle changes of peripheral anterior synechiae formation can be discovered and quantitated. Such knowledge is dependent on the ability to visualize all aspects of the angle recess no matter how narrow it appears. Primary angle-closure glaucoma caused by a pupillary block mechanism can be divided into either acute or sub-acute angle-closure or chronic angle-closure. The initiating event is a functional block between the anterior lens surface and the posterior pupillary portion of the iris. This results in trapping of aqueous in the posterior chamber thus pushing the peripheral iris forward and closing of the angle. Outflow resistance increases, intraocular pressure rises, and with time permanent synechial closure ensues. Oblique flashlight illumination showing shallow anterior chamber, corneal edema and mid-dilated pupil. Gonioscopic appearance (above) shows closed angle without any visible angle structures. Note how the corneal beam tapers towards the Schwalbe's line. Blood vessels are present in the normal angle and can often be seen upon routine gonioscopy. To a marked extent, their visibility depends upon the color of the iris, and to a lesser extent, upon the width of the angle. Gonioscopically visible vessels can be seen in more that 50% of blue-eyed individuals, but less than 10% of brown-eyed humans. They are more commonly noted in wide than narrow angles. It has been recognized for about three decades that there is a small group of patients with primary angle-closure glaucoma in the absence of classic pupillary block. These patients are typically discovered when an angle-closure attack occurs in the presence of a patent iridectomy. The mechanism appears to be an abnormality of the peripheral iris which allows occlusion of the trabecular meshwork on dilation of the pupil. 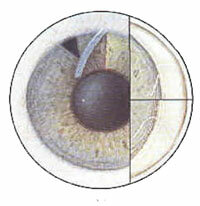 The classic picture is a normal appearing central chamber depth and a convexity of the peripheral iris. To fully understand this condition it should be divided into plateau iris configuration and plateau iris syndrome. The plateau iris configuration refers to an anterior chamber of normal depth axially with a flat iris plane on direct examination but a narrow angle on gonioscopic examination. The plateau iris syndrome refers to the clinical picture either of spontaneous or mydriatic-induced angle-closure despite a patent iridectomy. In the majority of cases of angle-closure glaucoma associated with the plateau iris configuration, iridectomy is curative. The widening of the angle is not as dramatic and may not only be limited to the iris periphery. If iridectomy fails, the plateau iris syndrome should be considered. The plateau iris syndrome must not be confused with other conditions such as imperforate iridectomy associated with angle closure, elevated intraocular pressure from residual peripheral anterior synechiae, angle closure due to multiple cysts of the ciliary body, and mydriatic-induced intraocular pressure rise without angle closure. Once the diagnosis of plateau iris syndrome is made, the treatment is by continuous use of miotics. If miotics cannot be tolerated, laser iridoplasty(gonioplasty) has been reported to be curative. Axial portion of the anterior chamber is of normal depth and an iridectomy is present at at 11 o'clock. 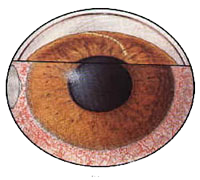 The plane of the iris is vertical, and the iris root undergoes a knee-shaped bend (insert lower right) in the extreme periphery, causing sudden narrowing of the angle in the presence of a patent iridectomy. Insert upper right shows a closed angle in spite of a deep central anterior chamber. Primary Open Angle Glaucoma (POAG), also known as chronic open angle glaucoma, is the most frequent type of human glaucoma. It is characterized by elevated intraocular pressure (IOP), cupping and atrophy of the optic nerve head, and typical visual field defects. There are no obvious ocular abnormalities, nor any specific systemic diseases related to POAG, though there is a higher incidence of the disorder in patients with diabetes mellitus and perhaps in hyperthyroidism. Both eyes tend to be involved at the same time and to a similar degree. All races have been noted to have the disorder and there is no sexual predilection. The prevalence of POAG in the Western world has been estimated to be about 0.5% and the incidence increases with age. Most cases are first detected after age 40. The cause of POAG is unknown, but it has been suggested that there are multifactorial heritable factors; in many cases there is a strong family history of the disorder. To date, no specific histopathological abnormality has been noted. The anterior segment including the angle appears to be within normal limits. The anterior chamber angle is normally invisible by direct viewing of the anterior segment of the eye. Trantas, in 1907, was the first ophthalmologist to report visualization of the angle; this in a case of keratoglobus in which he intended the limbus. Trantas coined the term, gonioscopy, but the first goniolens was the introduced by Salzmann in about 1914. Indeed, Salzmann personally mane many angle paintings but these were never published. Koeppe, Barkan, Troncoso, and Goldmann were other early contributors to the instrumentation of gonioscopy and the description of the angle in health and disease. Various types of goniolenses are now available and all are used in conjunction with the slit-lamp biomicroscope or another magnification-illumination system. Most gonioscopy is done by an indirect method in which a mirrored contact lens is used at the slit-lamp to observe the angle opposite to the mirror. In contrast, direct gonioscopy uses a dome-shaped contact lens which eliminates internally reflected light and allows direct visualization of the angle with a gonioscope. Composite drawing of the normal angle seen in normal eyes. Various widths of the normal angle seen in consecutive inserts. Note that the corneal optical wedge narrows as it approaches Schwalbe's line and seems to end there in the situation of a narrow angle. Damage to the nerve fibers of retinal ganglion cells is the most important sequellae of glaucomatous disease and is manifest clinically by alterations in the appearance of the optic disc. the pathogenic mechanism(s) by which an abnormality of intraocular pressure eventually results in retinal nerve fiber degeneration is a matter of intense debate. Histopathologic examination of the damaged optic nerve head reveals not only axonal degeneration of retinal ganglion cells but also loss of astroglial support tissue, reduction in disc vascularity, and collapse of the lamina cribrosa. Primary vascular, mechanical, and glial theories have all been suggested. Regardless of its etiology, there is a rather typical sequence of change that occurs to the optic disc in uncontrolled glaucoma.